Michael Jeffrey Jordan was born on February 17, 1963, in Brooklyn, New York. He played several different sports in high school and proved to be one of the best basketball players of Laney’s school. He was recruited by several college basketball programs, but he accepted North Carolina’s scholarship. Jordan became a star of Dean Smith’s team and was named ACC Freshman of the Year. He was also selected the NCAA College Player of the Year in 1983 and 1984. Jordan left North Carolina one year before his scheduled graduation, to enter the NBA draft. Michael Jordan’s net worth started going up when he was selected by the Chicago Bulls with the third overall pick. Jordan soon proved himself on the court. He scored an average 28.2 point per game on 51% shooting and helped the team make it to the playoffs. Jordan was voted an All-Star starter, due to his impressive game. Despite his injury in the second season, Jordan set the still-unbroken record for points in a playoff game with 63 in Game 2 against Boston Celtics. The season 1986/87 was one of the richest scoring NBA seasons. He scored 3000 points in the season with the average of 37 points per game. He also became the first to record 200 steals and 100 blocked shots in a season. In the next season, Michael Jordan was named the Defensive Player of the Year, with average 1.6 blocks and 3.16 steals per game. He led the Bulls to the Eastern Conference Finals in 1990 and they won their first NBA championship in 1991. Michael Jordan was praised for his power and leadership abilities on the court. The team won the championship in 1992 and 1993, dominating the basketball world. 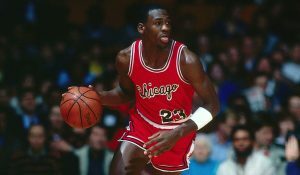 After a short stint in minor league basketball, Jordan came back in 1995, leading the Bulls to another championship win. In the following season, Michael Jordan noted an average of 30.4 points per game. The Bulls led the Finals series with 3-2 and Jordan executed the greatest clutch performances in NBA history. The team won their sixth championship and Jordan became the Finals MVP for the sixth time. Jordan retired for the second time in 1999 but returned to NBA as a part owner and president of basketball operations of Washington Wizards. In 2001, Jordan made a comeback and played for two more seasons for the Washington Wizards. His 2001/02 season ended abruptly due to a knee injury. Jordan became the all-leading scorer in his last 14th NBA All-Star Game in 2003. In the same year, Jordan was the only Washington player to play in all 82 games. This season was marked by his exceptional performance. The 2002/03 season was his final, and he played his last game in Philadelphia where he received a three-minute standing ovation. By the time he left the court, Michael Jordan’s net worth was estimated at $94 million, from all 15 seasons in NBA. Michael Jordan’s net worth was constantly going up thanks to the lucrative endorsement deals. He signed his first deal at the beginning of his career, in 1984, with Nike. 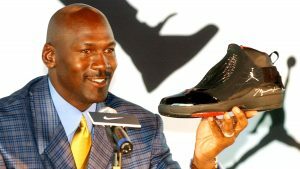 The five-year deal was worth $2.4 million and created the iconic Air Jordan sneakers. This partnership boosted Michael Jordan’s net worth for $480 million in the period from 2000-2012. The Nike-owned Jordan brand still dominates the basketball sneaker market and MJ now pockets $100 million a year from this deal. 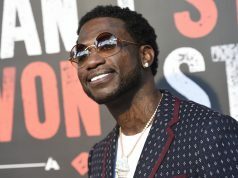 The basketball superstar also endorsed Gatorade, which brought him $18 million. He got $14 million from the Upper Deck trading card brand and $14 million from the underwear company Hanes (HBI). Jordan earned $10.6 million from XEL endorsement. The endorsement deals with Coca-Cola, Chevrolet, McDonald’s, Wheaties, Rayovac, and Ball Park Franks also increased the net worth of Michael Jordan. After his retirement, MJ has dived into some serious business ventures. He has made a successful transition from iconic athlete to a savvy businessman. His net worth has increased sufficiently, so he could purchase a stake in the Charlotte Bobcats in 2006. Four years later, Jordan became the first former NBA player to become the majority owner of a franchise. Since then, the franchises have escalated from $367 million to $1.1 billion, taking Michael Jordan’s net worth past $1 billion in 2014. Michael Jordan’s net worth in 2017 was estimated at $1.39 billion, making him the highest-paid athlete of all times. But, how much money does Michael Jordan make a year? The basketball icon still makes an average of $100 million per year, which is more than his estimated earnings after 15 years as an NBA player. It’s no secret that MJ enjoys luxuries. The sports king loves to splurge on good watches and has a collection of some rare pieces. He owns a white golf Ulysse Nardin Sonata worth $70,000 and a Richard Mille RM032 worth $175,000. His impressive collection includes a Rolex Daytona and an Urwerk-203. Jordan is also known to be a passionate gambler. Michael Jordan’s house in Florida is a custom-built $12.8 million mansion, featuring a golf course, where he spends most of the time. He also owns a $2.8 million house in Charlotte with a lake view. Jordan loves speed. He owns an extravagant collection of luxury cars including a Chevy C4 Corvette, a Ferrari 512 TR Porsches 911, an Aston Martin DB7 Volante, a Mercedes McLaren SLR 722 Edition and a Ferrari 599 GTB Fiorano. 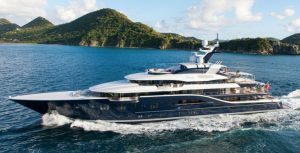 MJ also owns a private jet, as well as a 154-foot yacht. 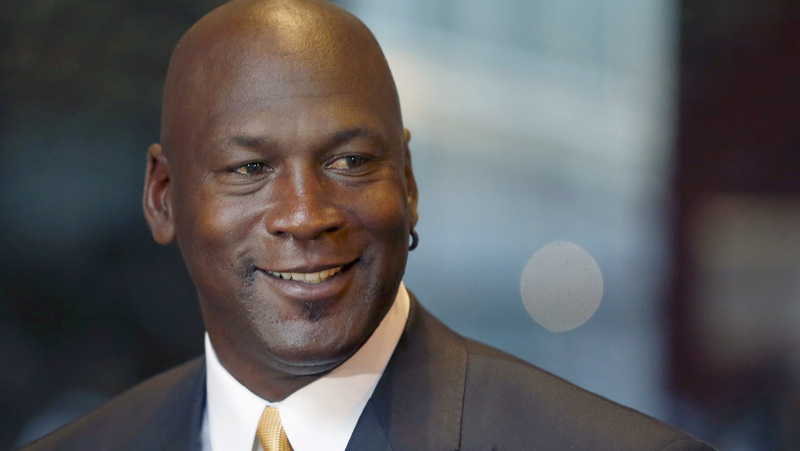 A part of Michael Jordan’s net worth has been used for donations to charitable organizations. The basketball king has promoted social advancement and improvement of the minority community. Throughout his career, MJ has supported many charity organizations such as the Boys’ and Girls’ Clubs of America, UNCF/College Fund, Special Olympics, Jackie Robinson Foundation, Make a Wish Foundation, Opportunity Village, and many others. Michael Jordan’s net worth has been steadily growing since the beginning of his career. Not only is he a legendary basketball player, but he has also turned out to be a savvy businessman and a great philanthropist. The sports king has recently joined the billionaire club, but his wealth will surely continue increasing. Visit our website to discover more celebrity net worth articles daily.